How many fomites can you spot in the picture above? 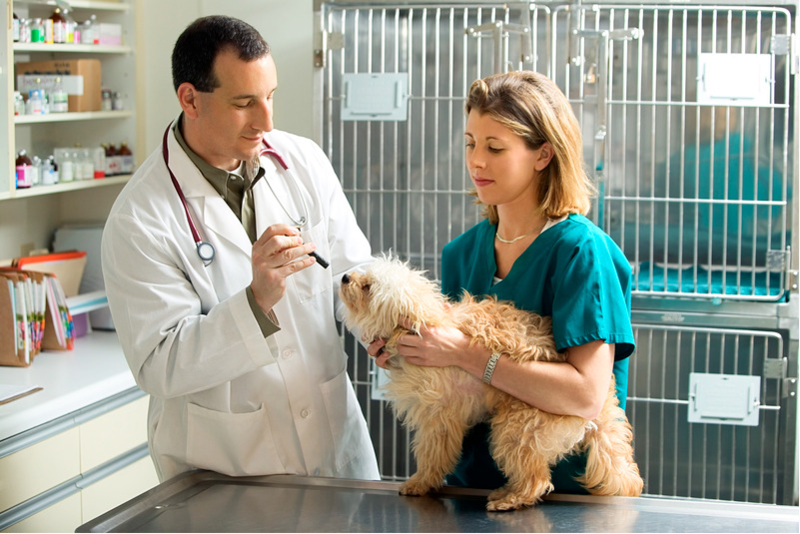 To give you a hint, the vet’s stethoscope, the exam table, and the technician’s scrubs are all examples. Have you guessed what a fomite is, and how it may play in the role of transmitting infections in our facilities? In a nutshell, fomites are inanimate objects that can transmit pathogens from one host to the next. They could be anything from an animal’s bed, collar or water dish, as well as any surface around your house or facility such as floors, counter tops and exam tables. An animal with a bacterial, fungal or viral infection can leave some of these pathogens on the objects that they touch, which then wait around to infect their next victim. In some cases, they can survive for weeks or even months at a time, presenting a huge risk for the spread of disease in your facility. While this may seem fairly obvious now, the impact that environmental surfaces and patient care equipment played on infection transmission was a bit of a mystery to the infection prevention community until not too long ago. Everyone was focusing on their attention hand hygiene and avoiding contact between sick animals. More recently, infection prevention experts have been advocating for proper cleaning and disinfection of fomites for healthier facilities. Seems simple enough, right? In reality, things get a bit more complicated. Certain types of surfaces transmit pathogens much more easily than others. Hard, non-porous surfaces like counter tops, plastics and stainless steel will transmit germs very easily, whereas soft, porous surfaces like clothing and cleaning fabrics have lots of holes and crevices for germs to hide out in. This means that these soft surface fomites are less of a risk, but can still have harmful pathogens hiding inside. In terms of disinfecting fomites, this difference between the type of surface is key. Hard, non-porous surfaces are easy to disinfect, since there’s nowhere for pathogens to hide. Soft, porous surfaces present more of a challenge, so it’s hard to guarantee that your disinfectant is working properly under these tough conditions. When in doubt, look for a product with a soft surface sanitizing claim, to feel confident that you’re eliminating most of the pathogens from these objects. The next time you’re cleaning and disinfecting your facility, give fomites the attention they deserve! Consider all of these surfaces that may be harboring harmful pathogens, and try your best to stop them in their tracks.